New York City-based digital marketing agency Path Interactive has once again taken home top honors on the Ad Age Best Places to Work list, securing the #4 spot in the 2017 survey. 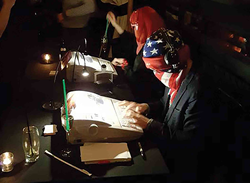 Path Interactive hosts performance artists The Bumbys at an annual holiday party. The bottom line is that fulfilled, motivated employees are a key component in doing any worthwhile work. We’re going to continue investing in even more initiatives that make the Path Interactive experience rewarding for our employees and, in turn, for our clients. Path Interactive, a digital marketing agency based in New York City’s Flatiron district, has once again taken home top honors on the Ad Age Best Places to Work list. The prestigious list annually aggregates fifty companies with high employee satisfaction rates in the marketing, advertising, and media spheres. First landing on the list in 2016, Path Interactive again placed in the top 5 in 2017, securing the #4 spot in the recent iteration. Path Interactive offers its employees plenty of perks, including company-covered medical deductibles, unlimited time off, 401k matching, and weekly group fitness classes. However, Michael Coppola, the agency’s co-founder and CEO, is quick to stress that these measures are not just a recruiting gimmick, but a genuine effort to try to make sure that team members are thriving and being rewarded for their efforts. The 2017 Ad Age Best Places to Work list was compiled as a joint effort between Ad Age and the Best Companies Group. Companies in pertinent industries were evaluated based on workplace policies, practices, philosophies, and demographics, which accounted for 25% of the ranking process, and on employee assessments of their experience, which accounted for 75% of the ranking process. The Best Companies Group analyzed these findings and compiled list results. Path Interactive is a digital marketing agency headquartered in New York City’s Flatiron District. Their expertise spans a full range of marketing services including SEM and display management, SEO, website design and development, and social media marketing. Path Interactive's client list includes respected brands such as Zagat, Time Inc., Scholastic, Carmex, and Jackson Hewitt. They are recent winners of Google’s 2017 Display Innovation Award in the Americas, the 2017 WebAward for Outstanding Achievement in Web Development, and the Award of Excellence and Distinction in the 23rd Annual Communicator Awards. They have appeared on the Crain’s Best Places to Work list in 2015, 2016, and 2017, and on the AdAge Best Places to Work list in 2016 and 2017, most recently ranking #4. Learn more about their work at http://www.pathinteractive.com.